The new ultra slim X464UNV features a 5.7 mm bezel (content to content) to create impressive high resolution videowalls with barely visible bezels. New Connectivity and Sensors allow additional creativity in the content displayed. The unique built-in NFC sensor in combination with NEC’s new Android app reduces installation and maintenance times, especially useful on larger installations. 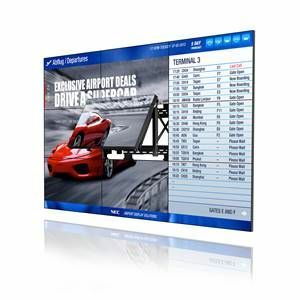 The perfect picture quality and high product reliability make the X464UNV an ideal solution for retail signage, control room applications, transport installations and the rental market.